Looking for some advice. Last weekend at Anglesey I noticed my oil temp getting as hot as 130 so I’ve decided to fit a cooler. My engine is a Vauxhall 1600 making just under 200 hp, it’s dry sumped and revs to around 9. Does anybody have an idea what size cooler I need? Does it matter if the cooler is in the return pipe back to the tank, or does it need to be in the oil feed line like a wet sumped car? I would suggest a 19 row cooler in the line from scavenge pump to tank.. If fitting oil to air cooler.. I have what is probably a similar set up to you but the 2.0 version. I spent what I believe to be wasted time and money experimenting with different sized coolers and found sizing correctly for track overcooled on the road. This is even with a thermostat. Go the Laminova route is my advice, really easy to install if you have a dry sump, between the scavenge pump and tank. As above this is on the assumption you have capacity in your radiator to take more heat. But if must install the air based coolers, , I found 13 row was ok unless it was a really hot day when a 19 row as ok. 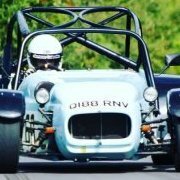 This was for 225 bhp and a target oil temp of 100 degrees C.
Seems to agree with what I said..I would go 19 row and blank for road..rather than being too hot on track in the summer..